Lesson planning is a central activity for developing and enacting teachers’ instructional practices. A well-designed lesson plan concretizes the multiple decisions made by teachers to organize their instruction, based on their knowledge of teaching and student learning (Remillard, 2005). However, lesson plans–even detailed ones—do not necessarily convey the rationale behind choices made regarding teaching approaches, sequences of ideas, and specific activities and representations of content (Brown, 2009). In fact, teachers use a variety of lesson plan formats that require a variety of different components, often based on school or district priorities (e.g. connections to other content areas, integration of technology, etc.). Likewise, some lesson plans have teachers indicate the science standards that are aligned with the activities, while other lessons do not. In our professional development program targeted to elementary science teachers and focused on physical science concepts (see more details of the PD model in van Garderen, Hanuscin, Lee, & Kohn, 2012), we support teachers in making the central features of a lesson plan more explicit. Given that the teachers who participate in our professional development program come from different school buildings and districts (and may use different curricula), we are interested in promoting their pedagogical design capacity (Brown, 2009) so they can apply and adapt the central features of lesson plan design into their particular contexts. We also use the 5E Learning Cycle (Bybee et al., 2006) as a model for guiding the organization of their lesson activities. A substantial body of research over past decades shows that lessons that utilize a learning cycle framework (Bybee, 1997) can result in greater achievement in science, better retention of concepts, improved attitudes toward science and science learning, improved reasoning ability, and superior process skills than would be the case with traditional instructional approaches (e.g., Bilgin, Coşkun, & Aktaş, 2013; Evans, 2004; Liu, Peng, Wu, & Lin, 2009; Wilder & Shuttleworth, 2005). During our professional development program, teachers learn first about physical science concepts, and then, they refine their understanding of the 5E Learning Cycle and select activities that are aligned to the purpose of each phase in their lesson plans. We know that learning to plan using the 5E Learning Cycle may be challenging for some teachers, as described in previous research studies (e.g., Ross & Cartier, 2015; Settlage, 2000). However, in our experience working with teachers, we noticed a new challenge for teachers’ lesson plan design: recognizing the sequence of concepts so that the lesson has conceptual coherence. Although teachers were often adept at aligning particular activities with specific phases of the 5E Learning Cycle based on their intended purposes, the complete sequence of activities they chose did not always exhibit strong conceptual connections or align with the scientific concepts stated in lesson learning goal(s). Many teachers focused more on the activities in which students engaged than the science concepts that students should be developing through the activities. A similar finding was also described in the Trends in International Mathematics and Science Study (TIMSS) video analysis study, which indicated that in the majority of US classrooms, “ideas and activities are not woven together to tell or reveal a coherent story” (Roth et al., 2011, p. 120). In our experience, we found that even teachers who are provided lesson plans that have a coherent sequence of concepts may not recognize this key element of lesson design, and may make adaptations to lessons that are counterproductive to their intent and purpose (Hanuscin et al., 2016). We saw teachers struggled to select activities whose underlying scientific concepts were connected to one another and followed a coherent progression that helped students connect the different concepts to better support their learning. That is, the particular challenge we noticed was related to the creation of a coherent conceptual storyline. What is a Conceptual Storyline? We use Ramsey’s (1993) definition of conceptual storylines in our professional development program. The conceptual storyline of a lesson refers to the flow and sequencing of learning activities so that concepts align and support one another in ways that are instructionally meaningful to student learning. We focus on ensuring that the sequence of activities for a particular lesson plan is coherent; that means, the organization of the underlying scientific concepts allows students to develop a full understanding of the scientific concepts stated in the lesson learning goals. Therefore, we expect the conceptual storyline of a lesson to be coherent both in terms of activities and scientific concepts to help students build an organized understanding of a scientific phenomenon (McDonald, Criswell, & Dreon, 2007). Similarly, incoming research suggests that the use of some strategies related to building coherence in lesson plans can impact student learning (see Roth et al., 2011). The conceptual storyline of a lesson is often an implicit dimension of planning and, as such, teachers may lack awareness of storylines and how to develop them. Therefore, a key goal that we implemented in our professional development model was supporting teachers’ development of coherent conceptual storylines as an explicit element of lesson design. We have been working with several strategies to help teachers recognize conceptual storylines as an explicit and central component of a lesson plan. We begin by using a Conceptual Storyline Probe (Hanuscin et al., 2016), an example of which is shown in Table 1, to highlight differences in two teachers’ lesson plans. Showing these differences to teachers is the first step to help them recognize that lessons have storylines with different levels of coherence. After reading both lessons, teachers share examples of the criteria they used for evaluating the lessons. In doing this, it is very important that PD facilitators or instructors let teachers talk and provide all the criteria they consider relevant. For example, these criteria might include whether the lesson is hands-on, and whether or not there are connections to the students’ daily lives. Sometimes, during the discussion teachers make comments about the sequence of activities (see examples of teachers’ responses in Figure 1). When prompted about this, teachers mention that there is ‘something’ in the lesson activities that make them flow differently. 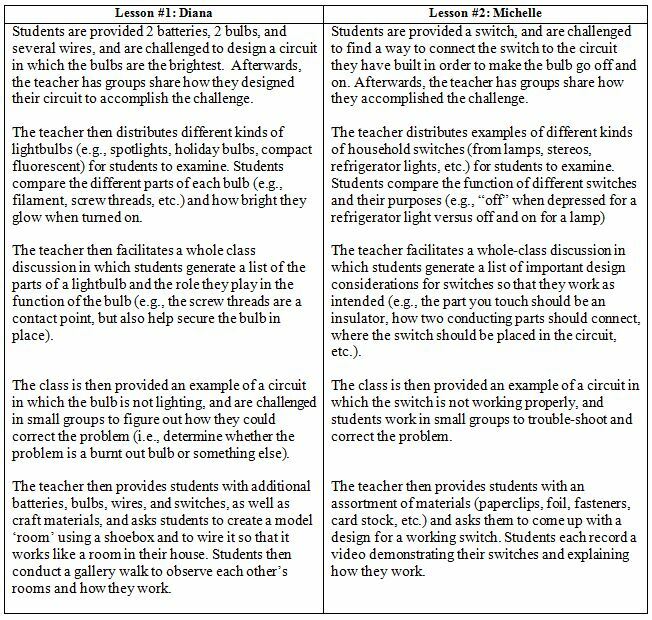 To be clear, Diana’s lesson includes different ideas about bulbs that lack connections between each other, while Michelle’s lesson organizes its activities in a sequence by which students can build an understanding of a central concept (switches). Therefore, noticing the difference in each lesson’s conceptual coherence is the first step in recognizing conceptual storylines as a component of lesson design. Figure 1 (Click on image to enlarge). 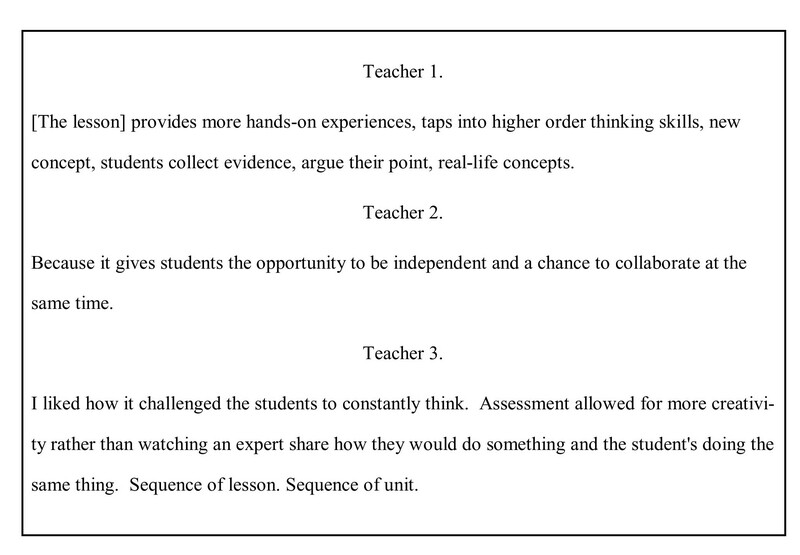 Examples of teachers’ initial responses to the evaluation of two lessons with different levels of conceptual coherence. Given the challenging nature of identifying the conceptual nuances in lesson plans, we recognize the importance of providing teachers support in constructing lessons with coherent conceptual storylines. To help teachers recognize coherent conceptual storylines as essential for well-designed lessons and encourage them to plan lessons that are conceptually coherent, our team has developed a strategy that includes four distinctive steps, as illustrated in Figure 2. Although our prior work was situated in elementary science, awareness of conceptual storylines can extend to all grade levels. Figure 2 (Click on image to enlarge). Steps for supporting teachers in developing a coherent conceptual storyline. For teachers unfamiliar with conceptual storylines as a component of lesson planning, we help them build their awareness of what storylines are, how important they are for meaningful instruction, and how they may support student learning. We help teachers think about the storyline of an instructional lesson or learning cycle by making an analogy using two familiar television shows, Saturday Night Live (SNL) and Downton Abbey. While SNL has consistencies in structure between shows (e.g. musical guest, celebrity monologue, etc.) the storylines of sketches within an episode, and indeed from episode to episode lack coherence. This means that the viewer can watch a whole episode or pieces of a given episode in any sequence. In contrast, to make sense of the storyline of Downton Abbey, one needs to watch the episodes in sequence to connect the events and ideas. Thus, Downton Abbey exemplifies a coherent storyline within and across episodes. When discussing this analogy between TV shows, teachers easily recognize that lessons also need to organize their concepts sequentially so each activity is necessary and sufficient for promoting student understanding. Drawing on this analogy helps teachers realize that conceptual coherence is an important feature of a lesson and that planning with conceptual storylines allows students to build science concepts within a larger arc and in connected ways—rather than as disconnected pieces. Once teachers recognize the importance of conceptual coherence in a lesson, they can use conceptual storylines for analyzing existing lesson plans. Some teachers examined their own lesson plans and others focused on district-provided lesson plans or lesson plans from commercial curricula. 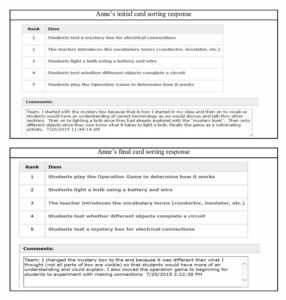 To help teachers learn how to identify and evaluate conceptual storylines, we provide them with two contrasting lesson plans, similar to the lessons presented in Table 1. One lesson has a coherent set of activities focused on a single concept (coherent conceptual storyline), and the second lesson includes activities that address multiple concepts loosely related to a topic (incoherent conceptual storyline). As teachers compare and contrast these lessons, they identify key considerations of different types of conceptual storylines. For example, the coherent conceptual storyline would sequence a key concept in such a manner that one concept builds to the next and allow students to develop the scientific concepts of the lesson learning goal, scientific phenomenon, or big idea. We also provide teachers support in identifying the lesson’s main scientific idea and the key concepts that students should develop in each phase of the 5E Learning Cycle. For example, we use a card-sorting activity to help teachers make connections between the specific key ideas in a lesson and the phases of the 5E Learning Cycle. Before introducing this aspect of lesson plan design, we have teachers sequence the activities of a lesson based on their own understanding of a good instructional sequence. After learning about the 5E Learning Cycle and conceptual storylines, teachers sort the cards again and provide a rationale for their choices. 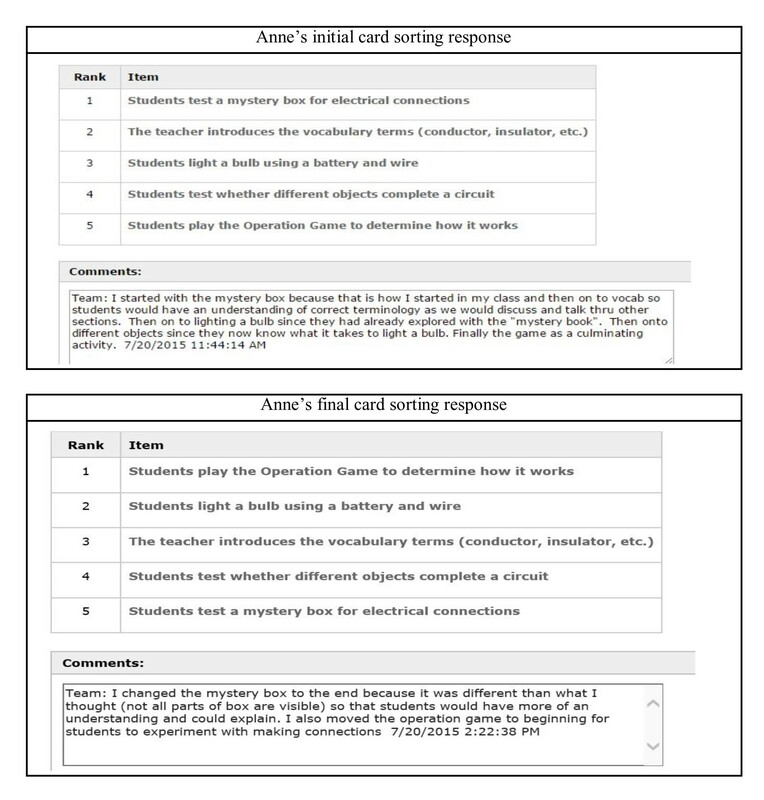 To illustrate this we include responses of Anne, a fourth grade teacher, to the card sorting activity about a lesson focused on identifying characteristics of conductors and insulators (See Figure 3). At the end, Anne was able to justify that the activity in which students test a mystery box for electrical connections was not adequate for the Engage phase of the lesson, because this activity did not provide enough evidence for students about the components of an electric circuit that would serve as a foundation for the following activities through the lesson. We recognize that the process of learning about conceptual storylines is often slow, and needs to be fostered through several activities. Figure 3 (Click on image to enlarge). Responses to a card sorting activity before and after learning about conceptual storylines. Overall, these learning opportunities allow for the teachers to examine different lesson plans and engage in discussions about what a coherent conceptual storyline looks like, as well as potential implications for student learning when using coherent or incoherent lessons. Once teachers were able to identify a lesson’s conceptual storyline and assess it for coherence, we engaged them in the design of a new conceptual storyline for their own lesson plans. We scaffolded this process by helping teachers break down a main concept, a scientific phenomenon, or big idea into more specific key ideas. Similarly, the use of the NGSS Disciplinary Core Ideas can help teachers identify key scientific concepts to organize the conceptual storyline. The example presented in Figure 4 shows how the main concept about magnetic poles is ‘unpacked’ in several sub-concepts. The teacher began the sequence by anticipating a student misconception and used it to build the storyline. Figure 4 (Click on image to enlarge). 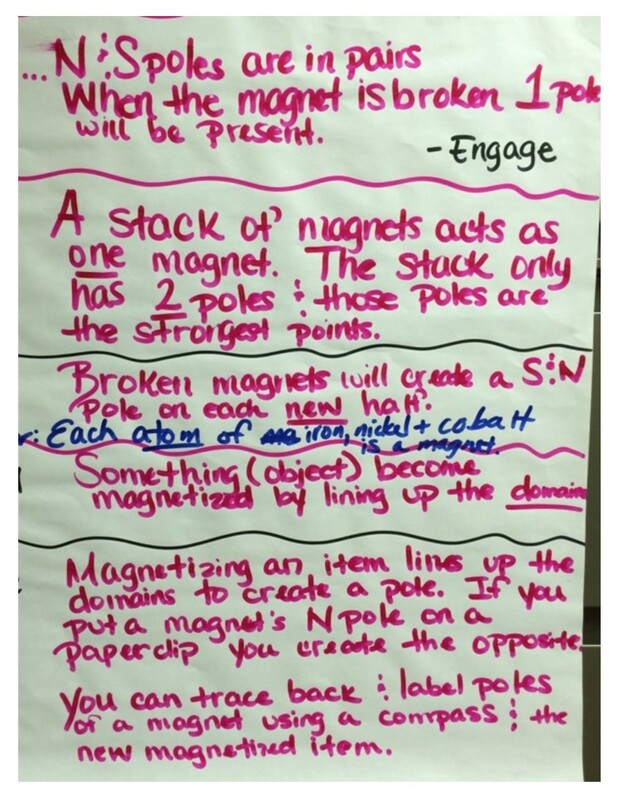 Examples of specific concepts about magnet poles organized by teachers in the creation of a conceptual storyline. To support teachers in making explicit connections among those key ideas, we introduce teachers to a Conceptual Storyline Map, an instructional scaffold adapted from Bybee’s (2015) work (see map in Appendix A). 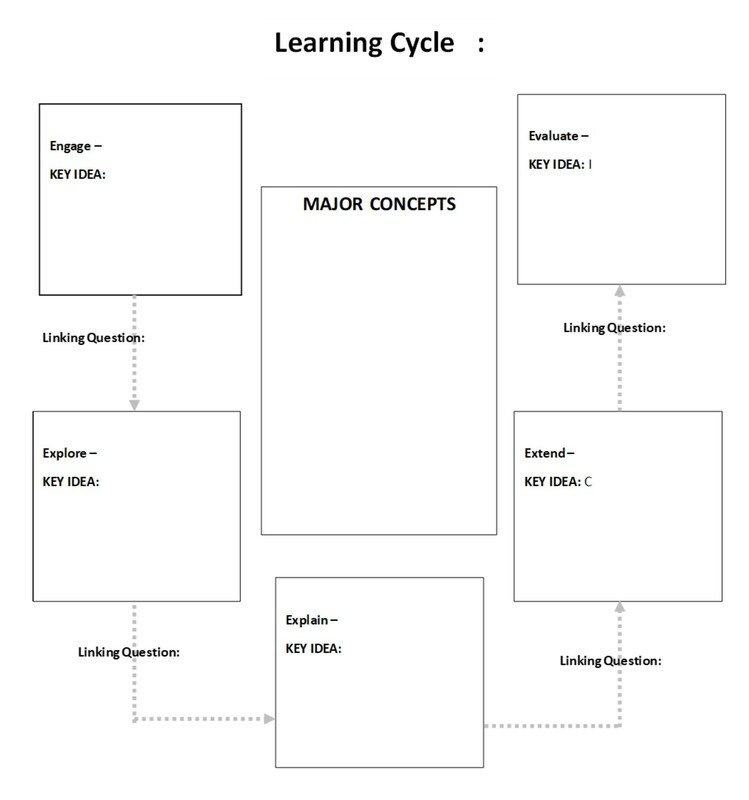 By using this map, teachers sequence the specific concepts and are able to connect two concepts through a linking question, while making connections to the phases of the 5E Learning Cycle. 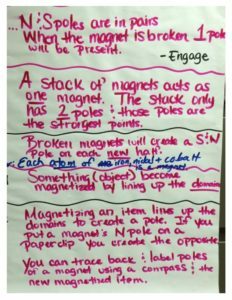 For example, one third grade teacher created a lesson plan to help her students understand how magnetic objects interact. When articulating the conceptual storyline she linked two important key ideas: 1) that magnets can attract, repel, or have no interaction with other objects, and 2) that magnets attract or repel other magnets, attract some metals (ferromagnetic), but have no interaction with other materials. In this case, the second idea builds on the first one and supports the construction of a conceptual storyline. The teacher included a linking question to make the connection between both ideas explicit, “What types of interactions do magnets have?”. We note this process may be frustrating for some teachers who are not as familiar with the content knowledge or struggle to articulate the links between key concepts in a conceptual storyline. We recommend that PD instructors or facilitators do not provide the connections between the key concepts of the conceptual storyline, because these connections are not necessarily explicit for teachers. In our experience, having teachers create the conceptual storyline in collaborative teams has been helpful for addressing these potential problems. Articulating concepts in a coherent conceptual storyline as an explicit component in lesson planning provided the teachers’ with a basis for the selection of activities and content representations. Therefore, the storyline acts as a backbone for the lesson. That backbone is a necessary foundation for the lesson, but does not provide a complete lesson plan; teachers must still select the particular activities and content representations to complete the lesson. In this way, the activities and content representations become the ‘connective tissue’ to the backbone of the lesson. Following teachers’ identification of the big idea or main concepts for the storyline, as well as the specific key ideas targeted during each phase of the learning cycle, the last step in teachers’ construction of conceptual storylines involves the ‘fine grain’ work needed to secure conceptual coherence in a lesson. In this step, teachers select activities and content representations (e.g., models, diagrams, analogies), and make any adjustments to their lessons to retain the conceptual coherence. As teachers select activities and content representations, they must attend to the ‘big idea’ they developed in Step 3 that encompasses the various activities in the lesson. Likewise, these activities might provide opportunities to explore a scientific phenomenon and engage students in tasks related to the NGSS performance expectations. Whether teachers use curricular standards for their big idea or independently identify the main concepts, the main ideas guide the development of the lesson storyline. 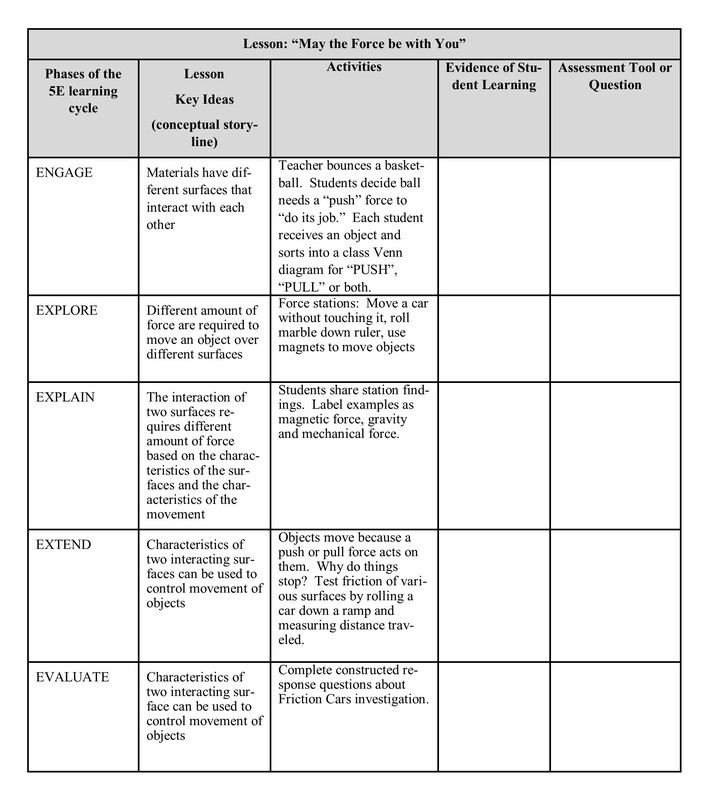 To assist teachers in planning a lesson with a coherent conceptual storyline, we provide teachers with a lesson plan form that designates the first column to the main concept that students are developing in that particular phase of the 5E learning cycle. Consequently, those concepts help teachers select and organize the activities of a lesson. 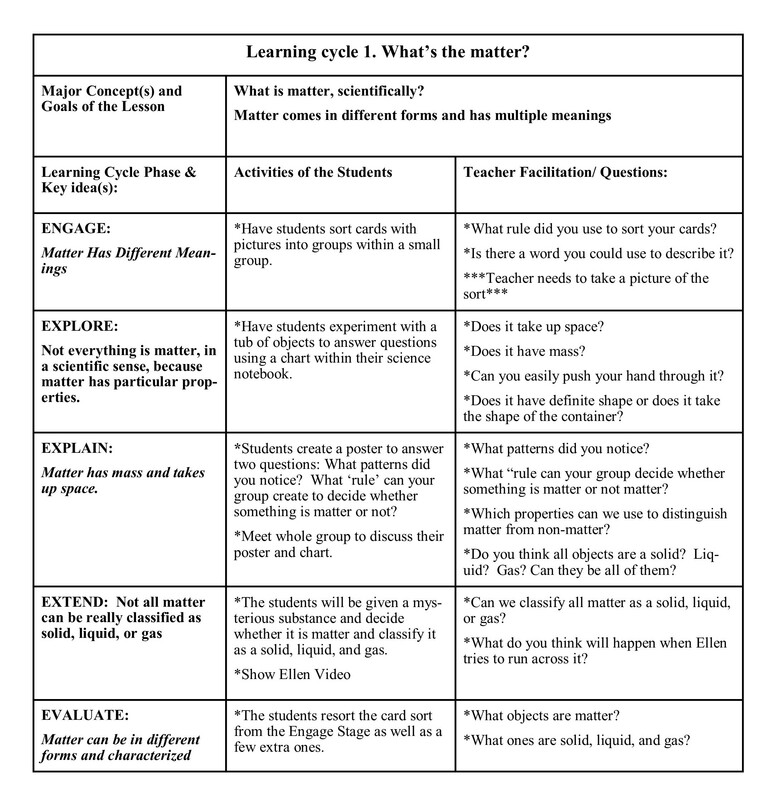 For example, one fifth grade teacher created a lesson plan named “What is matter?”, in order to help students develop a scientific definition of matter and an understanding that matter can take multiple forms (see Appendix B). The process of selecting particular activities and representations is iterative, and multiple adjustments can and should be made to ensure conceptual coherence across the big idea, the key concepts of the storyline, the concept representations, and activities. Because lesson plans are not created in isolation, we encourage teachers to make connections with ideas that were developed in previous lessons or relate to prior knowledge and students’ ideas. Designing lesson plans with a coherent conceptual storyline may take more time initially because of the added layer of complexity in aligning concepts and activities. However, every lesson plan is based on a storyline—coherent or incoherent. If teachers do not plan for coherence, the result may be a set of disconnected concepts and activities. In our professional development experience, we have noticed that teachers not only use conceptual storylines to select activities and content representations, but also for assessment purposes. In the last iteration of our program, we started supporting teachers in making connections between the concepts included in particular storylines and the ways to assess these concepts—either formatively or summatively (see matrix on Appendix C). We decided to include this component because we noticed teachers struggled to select topic-specific assessments strategies throughout the lesson. Given that many lesson plans require the inclusion of the assessment strategies, the use of conceptual storylines may help teachers identify what concepts need to be assessed during the lesson and when. The use of conceptual storylines may become an important tool to gather students’ evidence, especially to guide students in developing main scientific ideas. When we planned our entire learning cycle we really did go over what the storyline would be…I think [PD facilitator] really helped us understand what may be a huge piece of what’s missing with a lot of instruction…the storyline of each of the learning cycles really built upon the previous one. Conceptual storylines are just one tool that teachers can use to create coherent lesson plan designs. In emphasizing the importance of conceptual coherence, we do not mean to imply that content has greater importance than the process by which students learn the content—indeed, careful consideration should be given to the kinds of activities that will support students in building new understandings, developing facility with new skills, and developing confidence and competence as learners. We recognize that to create conceptual storylines, teachers need strong foundations in content knowledge to identify the key scientific concepts and the ways they are connected to each other. Therefore, in our professional development program, learning about conceptual storylines is embedded as part of a comprehensive curriculum that integrates content knowledge about physical science concepts and pedagogical lenses. For professional developers interested in adapting this strategy in their contexts, we recommend that learning about conceptual storylines be embedded in a larger professional development program rather than included as an isolated feature of lesson design. Abell, S. K., & Volkmann, M. J. (2006). Seamless Assessment in Science: A Guide for Elementary and Middle School Teachers. Portsmouth, NH: Heinemann. Bilgin, I., Coşkun, H., & Aktaş, I. (2013). The effect of 5E learning cycle on mental ability of elementary students. Journal of Baltic Science Education, 12, 592-607. Brown, M. (2009). 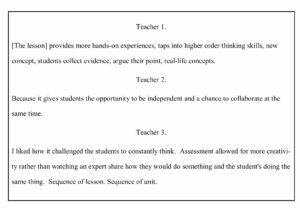 The teacher–tool relationship: Theorizing the design and use of curriculum materials. In J. T. Remillard, B. A., Herbel-Eisenmann, & G. M. Lloyd (Eds. ), Mathematicsteachers at work: Connecting curriculum materials and classroom instruction (pp. 17–35). New York, NY: Routledge, Taylor, and Francis. Bybee, R. W. (1997). Achieving scientific literacy: From purposes to practices. Portsmouth, NH: Heinemann. Bybee, R.W., Taylor, J.A., Gardner, A., Van Scotter, P., Carlson, J., Westbrook, A., & Landes, N. (2006). The BSCS 5E instructional model: Origins, effectiveness, and applications. Unpublished white paper. Retrieved August 2008, from http://www.bscs.org/pdf/5EFull Report.pdf. Bybee, R., Taylor, J., Gardner, A., Van Scotter, P., Carlson, J., Westbrook, A., & Landes, N. (2006). The BSCE 5E instructional model: Origins, effectiveness, and applications. Colorado Springs: BSCS. Bybee, R. W. (2015). The BSCS 5E instructional model—Creating teachable moments. Arlington, VA: NSTA Press. Evans, C. (2004). Learning with inquiring minds, students are introduced to the unit on gas laws and properties of gases using the 5E model. The Science Teacher, 71(1), 27-30. Hanuscin, D., Lipsitz, K., Cisterna-Alburquerque, D., Arnone, K. A., van Garderen, D., de Araujo, Z., & Lee, E. J. (2016). 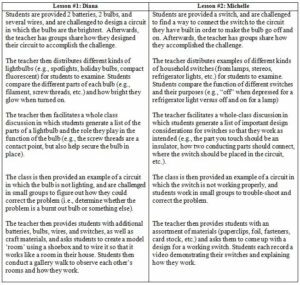 Developing coherent conceptual storylines: Two elementary challenges. Journal of Science Teacher Education, 27, 393-414. Liu, T. C., Peng, H., Wu, W. H., & Lin, M. S. (2009). The effects of mobile natural-science learning based on the 5E learning cycle: A case study. Educational Technology & Society, 12, 344–358. McDonald, S., Criswell, B., & Dreon, O. (2008). Inquiry in the chemistry classroom: Perplexity, model testing, and synthesis. In J. Luft, R. Bell, & J. Gess-Newsome & (Eds.). Science as Inquiry in the Secondary Setting (pp. 41-51). Arlington, VA: NSTA Press. Ramsey, J. (1993). Developing conceptual storylines with the learning cycle. Journal of Elementary Science Education, 5(2), 1-20. Remillard, J. T. (2005). Examining key concepts in research on teachers’ use of mathematics curricula. Review of Educational Research, 75, 211-246. Ross, D. K., & Cartier, J. L. (2015). Developing Pre-service Elementary Teachers’ Pedagogical Practices While Planning Using the Learning Cycle. Journal of Science Teacher Education, 26, 573-591. Roth, K. J., Garnier, H., Chen, C., Lemmens, M., Schwille, K., & Wickler, N. I. Z. (2011). Videobased lesson analysis: Effective science PD for teacher and student learning. Journal of Research in Science Teaching, 48, 117-148. Settlage, J. (2000). Understanding the learning cycle: Influences on abilities to embrace the approach by preservice elementary school teachers. Science Education, 84, 43-50. Wilder, M. & Shuttleworth, P., (2005). Cell inquiry: A 5E learning cycle lesson. Science Activities: Classroom Projects and Curriculum Ideas, 41(4), 37-43.